Leaving an institution does not mean that your account is deleted. You keep your content and portfolio pages when you move from one institution to another as long as you have your account. Institution administrators should not delete your account when they remove you from their institution. Memberships: Here you see to which institution(s) you belong. 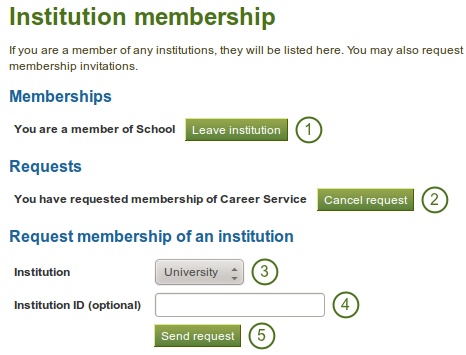 Click on the Leave institution button to remove yourself from an institution. If you do not see this button next to an institution, you cannot remove yourself but must ask an institution administrator to do so.